The Jacques Demy film was always a mood piece, with a dazzling centrepiece in ‘I Will Wait For You’, some astonishing set design and Catherine Deneuve’s radiant innocence. Its strength derived from the combination of a prosaic, bitter-sweet story of compromised romance with the lurid conventions of film musicals, so the soaring jazzy score is deliberately banal in terms of lyrics and plot. 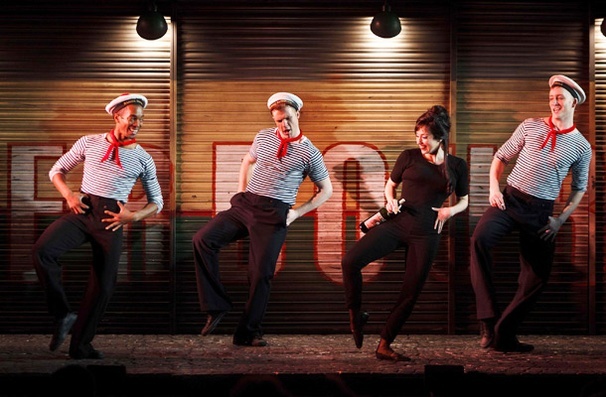 One problem that quickly emerges in the Kneehigh stage production now in the West End (they brought us the smash ‘Brief Encounter’) is that the English language makes the prosaic prose merely sound flat. That said, some great ideas abound. The children are puppets, the town of Cherbourg hovers in miniature over the set, sailors lift and carry the leads to simulate the weightlessness of love, and – of course – the audience gets covered in snow at the end. Best of all is the terrific Meow Meow adding a couple of dance routines, French lessons and a torch song to the proceedings. This, if anything, points up the dullness of the young leads even more – it’s not they’re fault; they’re meant to be ordinary people and Meow Meow is definitely not. Some years back another production of the same show ran with just six sheets of rain-soaked glass forming the set, and the intensity of passion was perfectly caught – this is a charming, surprise-filled night out, but it lacks the emotional bite of the original’s tragic storyline. The added dance music at the end is familiar Legrand but surely not in the original – does anyone know what it is? I KNEW you’d know, Porl!! !